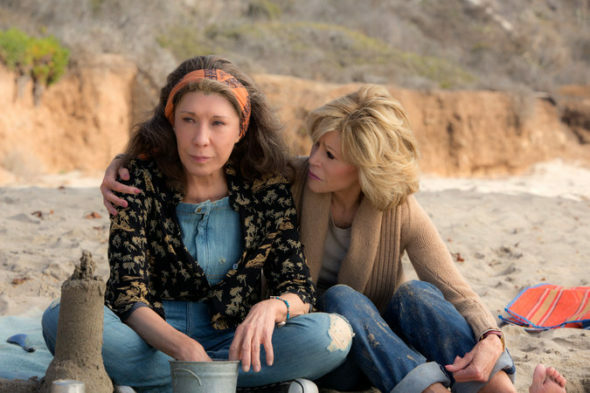 What’s in store for Grace and Frankie? Recently, series co-creator Marta Kauffman spoke with Deadline about her season three plans for the Netflix series. The comedy stars Lily Tomlin and Jane Fonda as two unlikely friends who come together after their husbands fall in love. The cast also includes Martin Sheen, Sam Waterston, June Diane Raphael, and Ethan Embry. Season two premiered in May. What do you think? Do you watch Grace and Frankie? What do you want to happen in season three? More about: Grace and Frankie, Grace and Frankie: canceled or renewed?, Netflix TV shows: canceled or renewed? Grace and Frankie on Netflix: Cancelled or Renewed for Season Five? Finally, a well written show that both my husband and I can enjoy together. Looking forward to season 3. I love love love this program! So funny, I’ll 71 and I love ALL the topics! Great going! This is the BEST show I have ever seen! I don’t usually watch comedy but these two actresses have great chemistry and talk about the subject that are relevant to women my age . I hope this show continue for as long as Jane and Lily can perform! And it is nice to see what true relationships are like be it straight or gay. I absolutely love Grace and Frankie. The episodes touch on experiences I can relate to in my 40s and how fabulous I want to be at 70. Lilly Tomlin and Jane Fonda are the perfect balance of yin and yan as well as all of the characters I Coyote and Bud. It is clever, witty, excellently written. Just fantastic. I watch both seasons whenever possible. This show is empowering and personal. I cannnot wait for season 3. LOVE this series…. Can hardly wait for season three! This show is hilarious. Lilly Tomlin and Jane Fonda are so fun together and all the other cast is also fun to watch. Can’t wait for season 3.